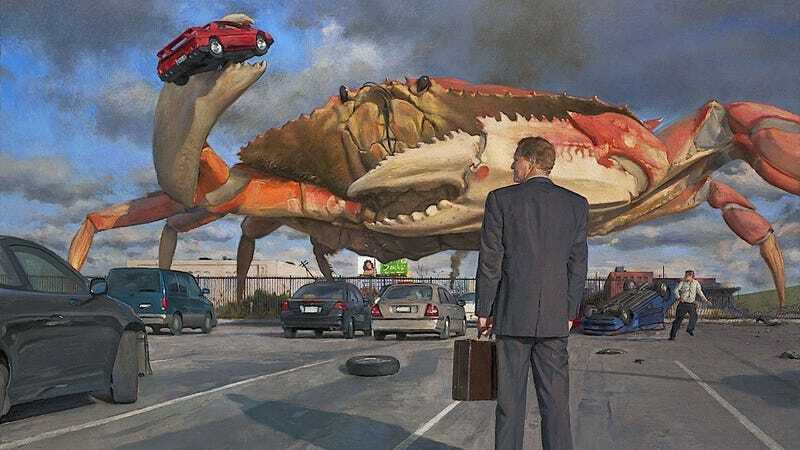 A man walking back to his car, calmly and resolutely facing a giant crab before him, sowing destructing and brandishing a Pontiac Fiero in its terrifying claw. This is Fatigue 2, the work of Californian painter John Brosio. I asked him about the significance of the piece, the giant crab, and why he chose a Pontiac Fiero to face ultimate destruction. It was a sequel to another piece, both of which have to do with being totally exasperated. I was just spent with the demands of others and those two images just sort of "happened." But the Pontiac was a toy! I had it here for a long time and thought it was just perfect. Partly had to do with the color being up there at the top of the painting but it just helped everything flow. As far as the monster, some have found a nostalgia in there for 50's science fiction but what was foremost on my mind was the notion of insurmountable obstacle. You can (and should) buy prints of this piece and other prints right here for $400 on JohnBrosio.com.